The North Carolina coast saw considerable activity by German submarines, or U-boats, in both World War I and World War II. Because the state was located midway along the eastern seaboard, enemy U-boats could easily attack merchant ships moving north or south along the coastal sea lanes. With ships sometimes sunk within sight of the coast and wreckage and bodies washed ashore, North Carolinians living along the barrier islands from Currituck to Cape Fear experienced the wars with an immediacy denied their inland compatriots. U-boats targeted predominantly merchant ships and trade vessels, rather than naval warships, waging economic warfare against the Allies and hoping to strangle Allied war production. In World War I, Germany's belated development of long-range submarines delayed their deployment, but beginning in May 1918, three of six large cruiser/minelayer class U-boats operating off the U.S. coast made attacks off North Carolina. The first U-boat to arrive, U-151, sank four Allied ships during 5-9 June in the first raids off North Carolina by an enemy warship since the War of 1812. During 4-6 Aug. 1918, the U-140 sank four other ships, including the Diamond Shoals lightship. In mid-August, the minelayer U-117 planted mines across the shipping lanes at Wimble Shoals, north of Cape Hatteras, sinking the British tanker Mirlo. The U-117 also sank another ship off North Carolina before returning home. The U-boat attacks ended only when the armistice took effect in November 1918. The destruction caused by this handful of submarines in 1918 was minor compared to the carnage wrought by German U-boats during World War II. Within weeks of the nation's entry into the conflict in December 1941, the Battle of the Atlantic reached U.S. waters, the German navy recognizing the exposure and vulnerability of American merchant ships along the Atlantic Coast. Once again the North Carolina coast became a major operational area; in 1942 the region off Cape Hatteras earned the nickname "Torpedo Junction." A fully loaded oil tanker, the Allen Jackson, is believed to have been the first victim of the U-boat attacks along the North Carolina coast, sinking about 60 miles off Cape Hatteras on 18 Jan. 1942. The first German submarine operation against the U.S. coast began in January 1942, when five large Type IX U-boats cruised between Nova Scotia and Cape Hatteras. Of these, the U-66 sank five ships off North Carolina, including the Canadian passenger liner Lady Hawkins, with its 250 crew and passengers lost at sea; the U-123 sank or damaged four ships; and the U-125 sank one ship. As fast as they could be refitted and readied for sea, other U-boats, including those of the medium Type VII classes that carried enough fuel to reach the U.S. coast, kept up the pressure. In February 1942 U-boats sank eight more Allied ships within a zone up to 200 miles off the North Carolina coast. In March 1942 larger numbers of U-boats operated off North Carolina, sinking or damaging 25 ships (the U-124 alone wrecked 5 of them). 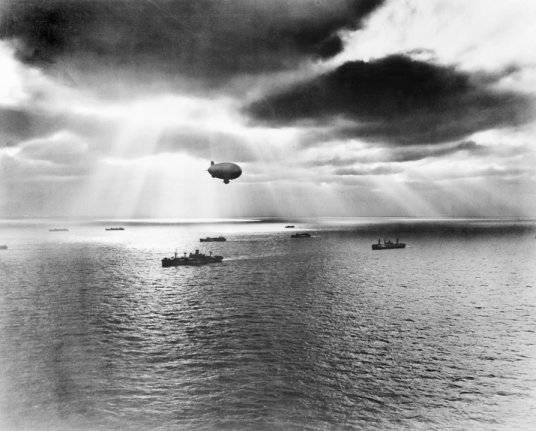 U-boat attacks previously concentrated north and east of Cape Hatteras were now occurring off Cape Lookout and Cape Fear as the German submarines cruised south along the coast. The strikes were close to shore because the shipping lanes had been tightened as a defensive measure. Cape Hatteras was judged to be so dangerous that merchant ships were ordered to pass it only in daylight to lessen the likelihood of attack. During the last 20 days of March 1942, U-boats claimed 23 ships off the North Carolina coast. In the single worst night for shipping of the war, U-boats destroyed 5 ships on 18 March. In April, attacks from as many as 17 different U-boats reached a peak, with 27 Allied ships sunk or damaged within the 200-mile zone off North Carolina. The first four months of 1942 saw nearly 70 ships torpedoed and sent to the ocean bottom. In fact, more than 90 percent of the ships lost at Torpedo Junction during the four years of submarine attacks went down between January and July 1942. Antisubmarine defenses along the coast tightened, however, and the tide began to turn. Local fishing and pleasure boats, converted into patrol boats, joined additional aircraft, U.S. Navy and Coast Guard antisubmarine vessels, and even a number of British armed trawlers to provide greater protection to merchant ships and local convoys. Sheltered moorings where ships could anchor overnight and form convoys were created at Cape Lookout in April 1942 and at Cape Hatteras the following month. Thereafter, the German toll on shipping diminished significantly. On 14 Apr. 1942 the destroyer Roper sank the U-85, the first U-boat to be sunk by the U.S. Navy, off Nag's Head. In May the navy began the formal convoying of merchant ships, causing U-boat sinkings to fall off dramatically. Two warships were sunk during the month, but so was a second U-boat, the U-352, off Cape Lookout. In June ten Allied ships were torpedoed, but in July the number dropped to three. Two U-boats, U-701 and U-576, were sunk, and a third was severely damaged by air attack. At this point the Germans withdrew most of their U-boats from the East Coast because of their lack of success in penetrating the tightened defenses. For the rest of the war, German operations along the East Coast were limited to occasional nuisance raids by individual submarines. In 1943 only one navy warship and two merchant ships were sunk off North Carolina; one ship was damaged in 1944. In April 1945 a number of U-boats mounted a final operation against the U.S. coast, sinking one ship and damaging another off North Carolina. The U-548 was sunk in this action. James T. Cheatham, The Atlantic Turkey Shoot: U-boats off the Outer Banks in World War II (1990). Michael Gannon, Operation Drumbeat: The Dramatic True Story of Germany's First U-Boat Attacks along the American Coast in World War II (1990). David Stick, Graveyard of the Atlantic: Shipwrecks of the North Carolina Coast (1952).